Need Passport Photos or Visa Pictures? Our Pacific Beach Passport Photos studio is convenient for anyone needing passport pictures or Visa photos in the San Diego area. We are located just off the I-5 Freeway in Pacific Beach 92109. Free parking is available in the 4650 Mission Bay Dr Branch of Chase Bank parking lot located next door. 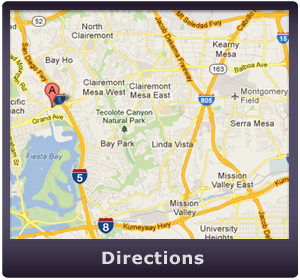 Map to Our San Diego Passport Photos Studio 92109. For directions to our Pacific Beach passport photos studio, head east on Garnet Ave and turn right into the Chase Bank parking lot where you may park. Alive Scan is located on the second floor next to this parking lot. From Ocean Beach, take Ingrahm Steet and turn right onto Garnet Ave. Turn right into the Chase Bank parking lot where you may park. Our Pacific Beach passport photos studio is next to the parking lot on the second floor. From La Jolla, hop on the I-5 Freeway and drive south. Take exit 23 (Balboa Ave/Garnet Ave), drive past Garnet Ave and immediately pull into the Chase Bank parking lot on your right. We have permission to park at Chase Bank. Alive Scan is located next door to Chase Bank on the second floor. From Bay Ho, hop on Balboa Ave. Turn Left onto Mission Bay Drive and then take your immediate right into the Chase Bank parking lot where you may park. Alive Scan is next to the parking lot on the second floor. From Morena, hop on Balboa Ave. Turn Left onto Mission Bay Drive and then take your immediate right into the Chase Bank parking lot where you may park. Alive Scan is next to the parking lot on the second floor. From Clairemont, hop on Balboa Ave. Turn Left onto Mission Bay Drive and then take your immediate right into the Chase Bank parking lot where you may park. Our Pacific Beach passport photos studio is next to the parking lot on the second floor.